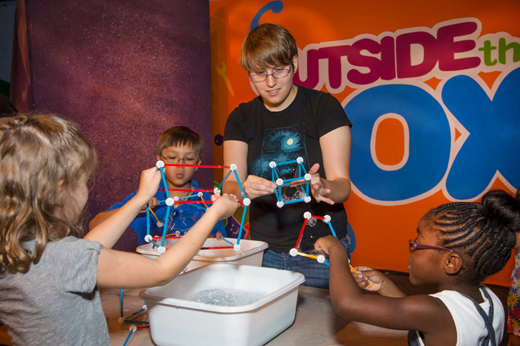 This summer, math graduate student Sarah Trebat-Leder is working with elementary-age children at the Children's Museum of Atlanta (center) and with advanced college undergraduates on the Emory campus. And during the school year, she organizes the Emory Math Circle for middle school and high school students. Emory Photo/Video. Each June and July, the Emory math department gathers a hive of brilliant minds from around the country for Research Experiences for Undergraduates (REU), a National Science Foundation initiative. The 13 participants at Emory this summer have come from Brown, Harvard, Indiana University, Princeton, Stanford, the University of Georgia and Yale. Number theorist Ken Ono heads up the Emory REU. He and the other instructors charge the group with problems relating to elliptic curves and Galois representations, mock modular and quantum modular forms, additive number theory and distribution of primes. "This is one of the top REUs in the country, because of the research you get to do here," says Sarah Trebat-Leder, an Emory NSF Graduate Fellow, who is an instructor for the group this summer. Trebat-Leder, who graduated from Princeton in 2013, came to two of the Emory REU summer programs herself as an undergraduate. "I learned how to be a mathematician," she says of the experience. "How to read technical math papers, how to give talks, how to write math and how to go about doing research."